Does Hanging an Owl Decoy Scare Away Squirrels? 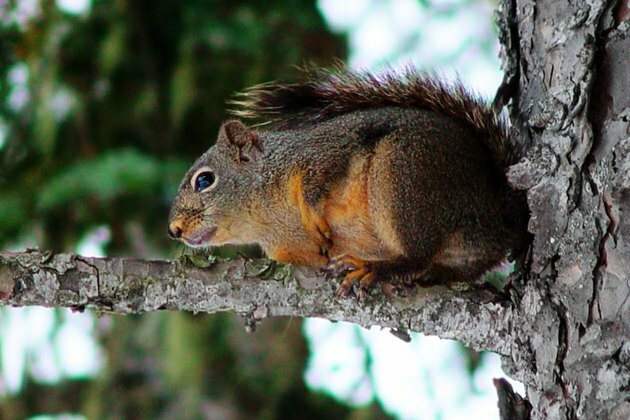 Squirrels may look cute, but to many gardeners and homeowners they can be pests. The most problematic situation is when squirrels set up nests in the attics of homes where they can chew through electrical wiring. In the garden they can chew up plants and dig up seeds. Other gardeners are worried about squirrels taking nuts and seeds left out for the birds. Squirrels can be a pest to many gardeners. An owl decoy in the garden will deter squirrels, as owls naturally prey on rodents. You will have to move the decoy around on a regular basis so the squirrels will not simply get used to its presence. The main problem with this is that owls also prey on other birds, so a hanging owl may also stop other birds from nesting and feeding in the garden. A range of squirrel-proof bird feeders and squirrel-proofing kits are available from garden centers that will still allow birds to feed in your garden. This is not an instant fix, but as soon as the squirrels work out that they can't get to the food in the garden they will soon move to somewhere else. You can buy squirrel repellents at stores or make them at home and spray them around the garden or add to the bird feed. These do not harm the birds, but will repel squirrels and other rodents. The homemade varieties involve mixing cayenne pepper, chilies and water. The capsaicin in the peppers puts off the squirrels. You can also use the homemade variety in attic spaces to stop squirrels nesting. The purchased ones are often derived from fox urine, which makes squirrels believe a predator is in the area. Motion activated sprinklers are a good way of stopping squirrels from getting at flowers and vegetables in the garden. The motion sensor detects movement in the garden and activates the sprinklers at an appropriate time. This will deter squirrels and any other land-based animals in the garden. The measures mentioned above are a good place to start to stop squirrels in the garden, but will not work if they decide to nest in the attic. Make sure branches of trees are cut back away from the house and all holes in the roof are patched up before mating season in the spring. Simon Green started writing professionally in 2007 and has written for various publications. He has covered local news for ManchesterOnline as well as business and technology news for NRI Digital. Green graduated from Manchester University with a degree in business studies before taking a postgraduate qualification in journalism.